Very young ensembles will shine with this charming and simple setting of Good King Wenceslas that will help develop music reading, rhythmic accuracy and part-singing skills. This cheerful song is a Caribbean circle game from Trinidad and Tobago arranged for young voices and piano or classroom instruments. The octavo includes directions for playing the game and the setting will nicely complement Kodály and Orff curricula as well as being an excellent addition to children's choral repertoire. Two contrasting moods are explored in this short setting that gives young singers a chance to develop a full, free and flexible sound. Includes two movements: Moon, Are You Out There? and Fine Day. From a 10th century Latin hymn, O Light born of light, this soaring work for treble voices and violin (or other C instrument) will add elegance and beauty to Christmas and other concerts. Recommended for high school and up, or better children's choirs. This fervent prayer for peace is richly arranged for two part treble voices with violin and piano. A touching and reverent work for sacred services and concerts. Vibrant mixed meters and buoyant vocal writing make this work for treble voices a joyful celebration of winter! Comparing a sudden snow storm to a shepherd piping down the valley with his flocks, the poetry combines with the music to create a vivid and exciting showcase for treble choirs. This whimsical set of pieces features three children's rhymes as text to create a colorful showcase for treble choir. Hush, the Waves tells of a mother and child awaiting the return of a father out on the whaling ships. Flying Man is an early twentieth century rhyme, which appeared around the same time as the first Wright Brothers' flights. To Brush the Cobwebs Off the Sky depicts the mystery of the skies and our longing to take flight. Whether performed separately or as a set, your singers will grow in musicianship. Performed by the Indianapolis Children's Choir on their recent European tour, these arrangements include optional English lyrics. Use the recorded pronunciation guide to help your choir learn the original Czech.Available separately: SATB, 2-Part Treble, ChoirTrax CD and IPak. Performance Time: Approx. 4:35. 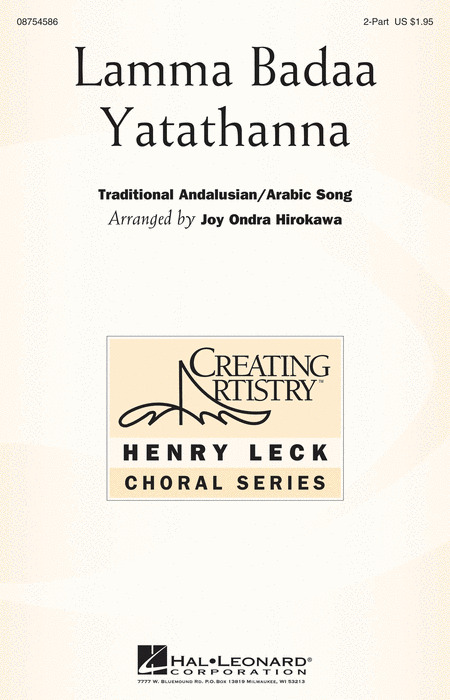 This gentle artsong has been set for two-part voices in a thoughtful and authentic way, making this contest favorite an exceptional choice for choral ensembles as well as soloists. This unique pair of carols has been arranged for two SA choirs. Excellent for antiphonal performances, this set is accessible and effective even for younger groups. Includes: It Came Upon a Midnight Clear, While By My Sheep. The haunting modal quality of this Celtic melody is enriched by the sonorous sounds of French horn in a setting that will feature your treble ensemble at their best! An excellent teaching piece, you will discover many performance options for this work. Inspired by the evocative, suggestive, and mysterious text by Robert Louis Stevenson, the composer has created a programmatic work marked by vocal ostinati, dynamic contrast and echoing voice effects to highlight the haunting poem. In compound meter, with optional soprano recorder or flute.